Public or private, large or small, fiscal and economic impact analysis can be a useful tool for any project. 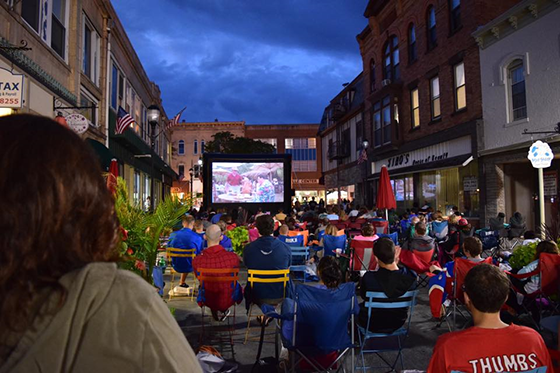 RCLCO has created the Fiscal Impact Valuation and Analysis model, or FIVA, to help answer an often daunting question: what impact will my project have on the community? 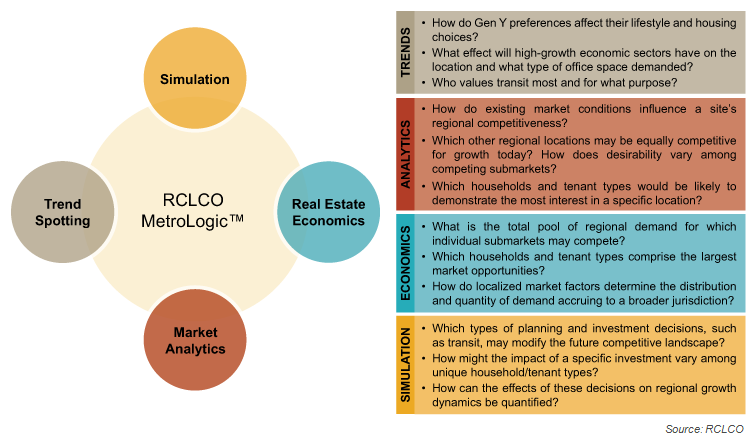 Whether this question is posed on a city, county, or even state level, RCLCO’s FIVA model adapts to the particular circumstances of any geography, taking into account local tax data, current budgets, local demographics, etc. 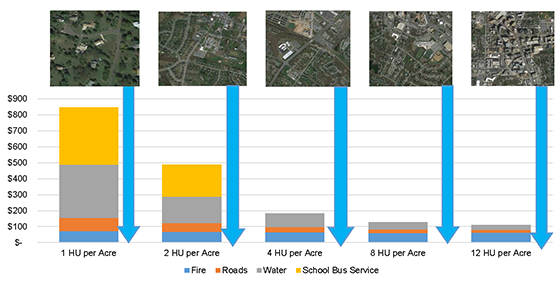 A useful tool for government officials to rely on when making important land use decisions, this model is also utilized by developers as an important means of showing the fiscal and economic benefits of their projects when attempting to gain entitlement approvals, make zoning changes, and much more. What Is Fiscal Impact Valuation and Analysis (FIVA)? 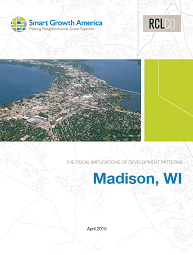 Fiscal Impact analysis determines a land use’s net benefit contribution to a local government. For instance, every land use (i.e., residential, retail, office, industrial, etc.) creates revenue for a local government in the form of property taxes, sales taxes, charges for services, etc. It also likely supports and creates jobs. In addition, every land use creates expenses for local governments in the form of charges for police, fire, roads, general government, parks, and other services. RCLCO’s FIVA model calculates these revenues and expenses in order to arrive at the net fiscal benefit to a local government. RCLCO’s model is a useful tool for understanding the potential impact of future land use decisions on a city, county, or state’s budget and is often used during comprehensive plan amendment hearings and other development approval actions being considered by locally elected governments, e.g. County or City Commissioners and others. The FIVA model provides insight and sometimes comfort to elected officials when making difficult votes on proposed projects, by providing a quantitative, independent analysis that forecasts the economic result of their decision. The FIVA model also takes into account multiplier data from the U.S. Bureau of Economic Analysis (known as RIMS II Multipliers) or IMPLAN, which helps to calculate the local and regional impacts of job growth caused by development. Shown below is a small example of the FIVA model. FIVA is a dynamic model that is fully customizable to any jurisdiction or project. It can quantify the impact of economic incentives, determine annexation feasibility, examine public-private partnerships such as Tax Increment Finance (TIF) sharing arrangements, run multiple scenarios, provide sensitivity analyses, and much more. 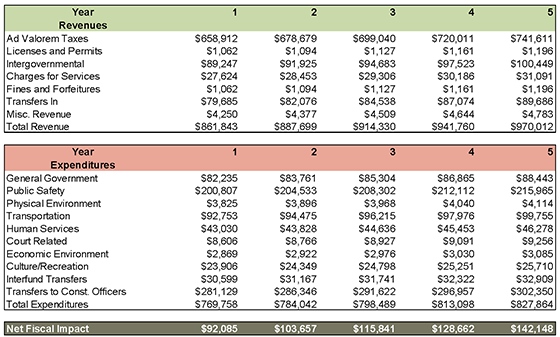 In the Net Fiscal Impact example below, the model is calculating the revenues and expenses to local government caused by a hypothetical mixed-use project. After calculating these revenues and expenses over a five-year period, FIVA shows the net fiscal benefit to the local government for each year. The FIVA model can be set up to calculate this impact across multiple time horizons and jurisdictions. By utilizing the FIVA model, RCLCO can help show the true, quantifiable impacts of any development on any jurisdiction, thus giving developers, stake holders, and local governments the information they need to make responsible decisions regarding land use and future development. This can help to reduce the delays that often occur as local governments and planning review boards analyze potential impacts on their budgets and on their communities. If you are planning a project that could use the insights provided by FIVA, reach out to RCLCO for more information. Article and research prepared by Brian Martin, Vice President, and Karl Pischke, Associate.